The brand we use is the reverse K – R as shown here. It is registered with the state of Wisconsin DATCP for identification on the left shoulder of both equine and cattle. The brand idea originated when Cody and Debbie married in 2009. Debbie’s maiden name was Kuenne. The K is reversed symbolizing looking back on her life as a Kuenne. The R is facing forward representing the present and the Rabska name. 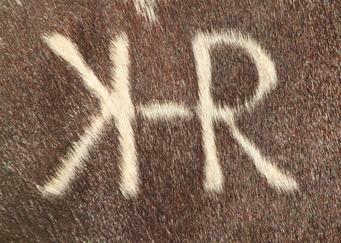 Hence, K BAR R was born when we created our horse ranch. K BAR R Ranch & Arena produces correct & beautiful American Paint horses, along with Miniature Texas Longhorns and miniature bucking bulls. If you see any horses or cattle with this brand, you’ll know they came from K BAR R Ranch & Arena!